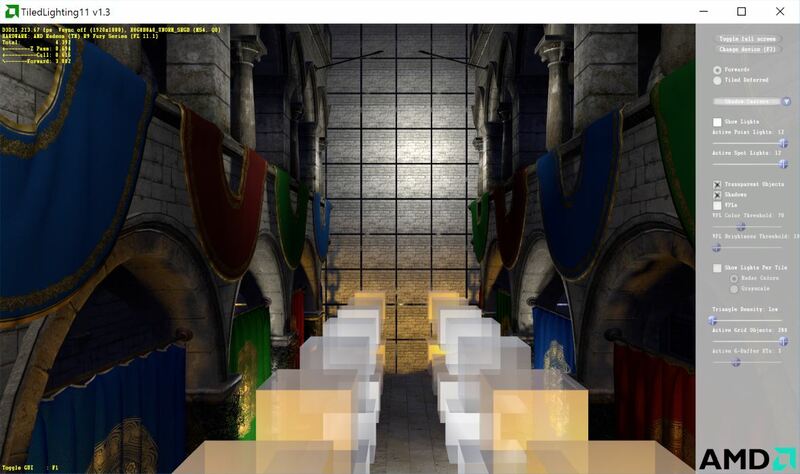 This sample provides an example implementation of two tile-based light culling methods: Forward+ and Tiled Deferred. Both methods support high numbers of dynamic lights while maintaining performance. They utilize a Direct3D 11 compute shader (DirectCompute 5.0) to divide the screen into tiles and quickly cull lights against those tiles. In addition to standard point and spot lights, this sample supports shadow-casting lights (point and spot). Moreover, it extends tiled light culling to work with alpha-blended geometry. It can also spawn virtual point lights (VPLs) to approximate one-bounce global illumination, as seen in AMD’s Leo Demo.